Or, read on to find out how it works, who it is suitable for and learn about the pros and cons of this device. How does the Pocketalker work? This device is basically an omnidirectional microphone that picks up the sound and sends it straight to your ears via a cable. This sounds cumbersome, but it is an arrangement that appears to work really well for people. 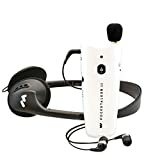 The microphone can be placed closer to the sound source you are trying to pick up making it very easy to enhance what you are really interested in hearing. It appears to work particularly well for a meeting, at the dinner table or in the doctor´s office. In short in any situation where you want to be able to ignore the background information and focus on someone who is speaking to you or a specific source of sound. The fact that you can easily change the direction the microphone is pointing in you can really easily zoom in on the sounds you want to hear. This helps to alleviate the problem of not being able to focus on what is being said due to too much background noise. The ambient noise is not completely eliminated, but more than enough for the mind to be able to concentrate on the sounds you want to hear. You can choose to use this device with earbuds or headphones, whichever you prefer. Both approaches help to block out most of the ambient noise. However, it is important to note that there is a bit of an issue with the way the device works. Some users find that because the microphone is quite close to them that their own voice is amplified too much when they speak. They tend to compensate for this by speaking quietly, but this can make it hard for others to hear you. If it was possible to use Bluetooth headphones with the Pocketalker this would be less of an issue. Unfortunately, there is no Bluetooth capability built into the device, so it is not possible to place the unit further away from your mouth. Although there is an extension cord included in the kit that could provide a solution for some. The inclusion of this cord in the kit means that if you wanted to you could place the device on a table further away from you. This cord is primarily designed to be used in situations in which the microphone does not need to be periodically redirected. For example, it is ideal for watching TV while sitting at a reasonable distance in a comfortable chair. A lot of people also use this cord when making phone calls. They dial the person and ask them to wait a moment while they place the mobile on the table near the microphone. It enables someone who is hard of hearing to still be able to use the hands-free capability of a modern Smartphone. How much is a Pocketalker Ultra going to cost me? The Pocketalker Ultra 2.0 is at the cheaper end of the pricing scale. So, is very affordable. What do users think of the Pocketalker Ultra hearing enhancers? There were very mixed reviews for this product. The majority gave it five stars, but a significant percentage of people gave it just one star. This was the case across all of the review sites we saw. Users either really loved it or loathed it. How effective are Pocketalker Ultra hearing amplifiers? When it comes to effectiveness the Pocketalker scores well, once people got used to it they could hear a lot more. Little tricks like not putting it on a table that was going to be used to place drinks on it made all the difference. It is a microphone so if you put a glass down next to it that noise is going to be directly fed into your ears. The fact that it has a T-coil built into it is a nice touch. In a loop equipped room the microphone can be turned off completely and the loop used instead. Something you cannot do with all hearing enhancement devices. How comfortable are these hearing amplifiers to wear? The fact that this device can be used with either earbuds or headphones means it is easy for the user to find a configuration that is comfortable for them. However, some people do not like the fact that it is very obvious that they are using a hearing amplifier. Can they be worn in both ears? 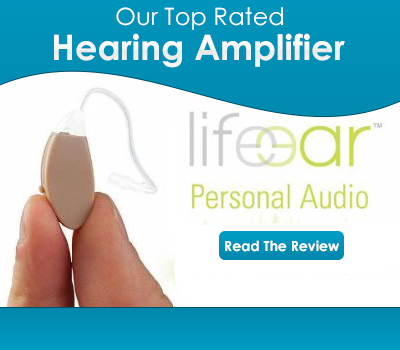 You can definitely use this device to enhance the hearing in both ears. If you only need it in one ear you can just wear one earbud. The 2.0 version has a balance controller. This means that you can change what you hear in each ear, something a lot of users find invaluable. Does Pocketalker Ultra offer a good level of support? The firm that makes this innovative hearing device is called Williams Sound. They have been in business since 1976, which is a good sign. However, we could not find any information pertaining to how helpful their customer support team was. The good news is that they definitely have one and that they can be contacted over the phone as well as via e-mail. Can you buy spare Pocketalker Ultra tubes and tips? You can buy all sorts of spares and accessories for this device. So, you should be able to keep it going for many years to come. Where can I buy a Pocketalker Ultra hearing amplifier? Williams Sound sells their Pocketalker Ultra 2.0 on Amazon, so that is where we suggest you buy it.